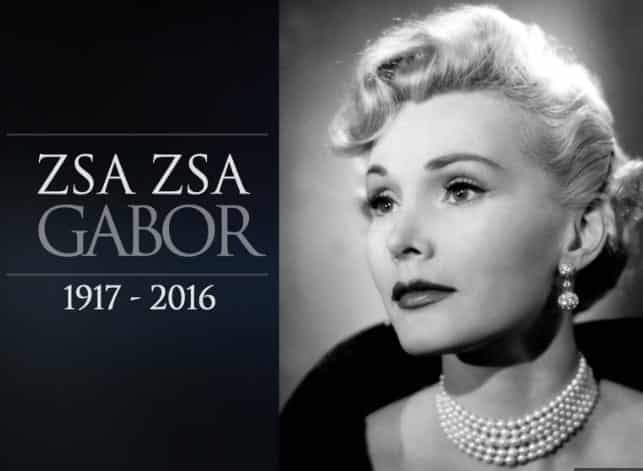 Hungarian actress Zsa Zsa Gabor died of a heart attack Sunday at her Los Angeles home. “We tried everything, but her heart just stopped and that was it,” her husband, Frederic von Anhalt, told the Associated Press. “Even the ambulance tried very hard to get her back, but there was no way,” he said. The celebrity, known for her multiple marriages and jet-setting lifestyle, had suffered a spate of setbacks to her health in recent years. After a stroke in 2005, she had been hospitalized repeatedly since 2010 after breaking her hip in a fall. Known more for her public antics and lavish ways than acting abilities, she was likely the first figure to inspire the phrase “famous for being famous.” She died just two months short of her 100th birthday. This entry was posted on December 19th 2016 at 7:16am/07:16 and is filed under Entertainment, Live News Column 1. You can follow any responses to this entry through the RSS 2.0 feed.